If someone compiled a list of the most well known boxers in the world the name Adrien Broner would appear rather early. 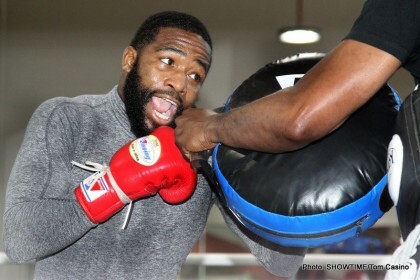 Adrien “The Problem” Broner was touted as the second coming PPV star based off his performances in the 130 and 135 pound divisions. And for a while a majority of the boxing world fell into a love-hate relationship with him. After his loss to Marcos Maidana, Broner has relatively stayed on a low profile and held back on the public antics( most likely due to a changed lifestyle after getting married). However in the ring, he faces some serious issues. After his bouts against the likes of Fernando Quintero and former WBA Welterweight Titlist Paulie Malignaggi, it showed that boxers who use angles and movement frustrate the relatively flat footed Broner. Inside fighters also make him rather uncomfortable. In his past bouts against Gavin Rees and Marcos Maidana it was shown that through smothering, and staying in close, you can prevent him from mounting any type of offence, for a short period of time at least. Something must change in his camp, whether it be his trainer, or how he trains. His lack of lateral movement prevent him from getting out of the way of punches. This in turn makes him rely heavily on his “shoulder roll” form of blocking, which can’t stop every shot coming his way, as Marcos Maidana proved in their 2013 meeting. But of course, every fighter has his flaws, but when you garner as much attention as 3 division titlist Adrien Broner, these flaws stand out like a sore thumb. The Light-Welterweight and Welterweight divisions are scolding hot right now and are bursting at the seams with potential fights for this future star. Previous boxing news: Huck defends WBO Crown vs. Larghetti on August 30!